The New York Yankees' 2001 season was the 99th season for the Yankees. The team finished with a record of 95-65 finishing 13.5 games ahead of the Boston Red Sox. New York was managed by Joe Torre. The Yankees played at Yankee Stadium. Roger Clemens had sixteen straight wins, tying an American League mark shared by Walter Johnson, Lefty Grove, Schoolboy Rowe, and Smoky Joe Wood. Clemens would finish the season with the AL Cy Young Award and become the first pitcher to win six Cy Young Awards. Another chapter was written in the story of the Yankee-Red Sox rivalry. On September 2, 2001, Mike Mussina came within one strike of a perfect game before surrendering a bloop single to Carl Everett. This was Mussina's third time he has taken a perfect game to or beyond the 8th inning. Coincidentally, it would have been the 3rd perfect game in for the Yankees in a span of 4 seasons and could have been the 4th perfect game in franchise history. In the emotional times of September 2001 in New York City, following the September 11 attack on New York's World Trade Center, the Yankees defeated the Oakland A's three games to two in the ALDS, and then the Seattle Mariners, who had won 116 games, four games to one in the ALCS. By winning the pennant for a fourth straight year, the 1998–2001 Yankees joined the 1921–1924 New York Giants, and the Yankee teams of 1936–1939, 1949–1953, 1955–1958 and 1960–1964 as the only dynasties to reach at least four straight pennants. The Yankees had now won eleven consecutive postseason series over a four-year period. However, the Yankees lost the World Series in a dramatic 7 game series to the Arizona Diamondbacks, when Yankees star closer Mariano Rivera uncharacteristically lost the lead – and the Series – in the bottom of the ninth inning of the final game. With the loss, this marked the second time in five years that a team lost the World Series after taking a lead into the bottom of the ninth inning of Game 7 (following the Cleveland Indians in 1997) and the first time since 1991 that the home team won all seven games of a World Series. Despite the loss in the series, Derek Jeter provided one bright spot. Despite a very poor series overall, batting under .200, he got the nickname, "Mr. November", for his walk-off home run in Game 4, though it began October 31, as the game ended in the first minutes of November 1. In calling the home run, Yankees broadcaster Michael Kay said "See ya! See ya! See ya! A home run for Derek Jeter! He is Mr. November! Oh what a home run by Derek Jeter!" He said this after noticing a fan's sign that said "Mr. November". Also, during the emotional times following the attacks, Yankee Stadium played host to a memorial service, just before the Yankees played their first home game following the attacks. The service was titled "Prayer for America". November 21, 2000: Joe Oliver was signed as a Free Agent with the New York Yankees. November 30, 2000: Mike Mussina was signed as a Free Agent with the New York Yankees. December 7, 2000: Dwight Gooden signed as a Free Agent with the New York Yankees. December 7, 2000: Luis Sojo was signed as a Free Agent with the New York Yankees. December 11, 2000: Brandon Knight was drafted by the Minnesota Twins from the New York Yankees in the 2000 rule 5 draft. February 15, 2001: Henry Rodriguez was signed as a Free Agent with the New York Yankees. March 21, 2001: Drew Henson was traded by the Cincinnati Reds with Michael Coleman to the New York Yankees for Wily Mo Pena. March 28, 2001: Glenallen Hill was traded by the New York Yankees to the Anaheim Angels for Darren Blakely (minors). March 28, 2001: Brandon Knight was returned (earlier draft pick) by the Minnesota Twins to the New York Yankees. March 30, 2001: Brandon Knight was released by the New York Yankees. April 1, 2001: Brandon Knight was signed as a Free Agent with the New York Yankees. June 5, 2001: John Ford Griffin was drafted by the New York Yankees in the 1st round (23rd pick) of the 2001 amateur draft. Player signed June 14, 2001. June 5, 2001: Bronson Sardinha was drafted by the New York Yankees in the 1st round (34th pick) of the 2001 amateur draft. Player signed June 13, 2001. June 19, 2001: Henry Rodríguez was released by the New York Yankees. June 20, 2001: Joe Oliver was released by the New York Yankees. July 4, 2001: Bobby Estalella was traded by the San Francisco Giants with Joe Smith (minors) to the New York Yankees for Brian Boehringer. July 30, 2001: Sterling Hitchcock was traded by the San Diego Padres to the New York Yankees for Brett Jodie and Darren Blakely (minors). August 31, 2001: Randy Velarde was traded by the Texas Rangers to the New York Yankees for players to be named later. The New York Yankees sent Randy Flores (October 12, 2001) and Rosman Garcia (October 11, 2001) to the Texas Rangers to complete the trade. The Yankees taking the field during a late August 2001 game at Edison Field. Yankees win series 3-2, becoming the first team in MLB history to win the ALDS after dropping the first two games at home. 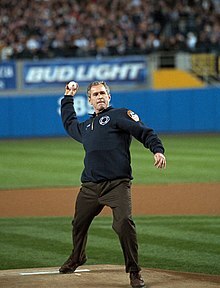 President Bush tosses out the ceremonial first pitch before a 2-1 Yankee victory in Game 3 of the 2001 World Series. Roger Clemens became the first pitcher to reach his 20th win with only 1 loss. ^ Nemec, David; Flatow, Scott. Great Baseball Feats, Facts and Figures (2008 ed.). New York: Penguin Group. p. 234. ISBN 978-0-451-22363-0. This page was last edited on 16 January 2019, at 15:39 (UTC).